Based on a popular Japanese manga and anime series, Death Note is an Americanized film adaptation that stars Nat Wolff as troubled teenager Light Turner, who discovers an ancient book with the title “Death Note” on its cover as it falls from the sky. Upon opening the text, he is encountered by an malevolent spirit named Ryuk (Willem Dafoe), who explains that the magical book has, among other things, the ability to end the life of whomever Light chooses to write down on any of its pages. After a successful trial that gruesomely dispatches the school bully, Light teams up with classmate and burgeoning love interest Mia (Margaret Qualley) to purge the world of those whom the two teens deem undesirable. The mysterious deaths of criminals and terrorists across the world sparks interest from international law enforcement as well as an inscrutable detective named only “L” (Lakeith Stanfield), who has managed to pinpoint the source of the killings to Light’s hometown of Seattle. Meanwhile, Light’s father (Shea Whigham), a local police officer, continues to work with L and a host of FBI agents to track down the killer while being oblivious to the fact that Light is responsible for the emerging pattern of murders. L soon narrows his suspicions on Light and after a coffee shop confrontation, Light races to discover L’s true identity so that he can be named in the book and removed from the equation. Being unfamiliar with the source material, I went into Adam Wingard’s effort with an open mind about how he chose to adapt the sizable comic collection but it’s not hard to imagine that there was quite a bit of material that was lost in translation. There are no shortage of plot holes and pacing issues within this story, which starts out pretty well as a sort of twisted YA love fantasy but goes steadily downhill after a poorly conceived montage transitions the film into a more by-the-numbers police procedural. It’s a busy film packed with plenty of story details and arbitrary rules but every plot element feels like it was condensed down to its most basic form, largely devoid of nuance or subtext so as not to lose any couchbound viewers along the way (lest they get distracted by their smartphones during the movie). Wolff and Qualley do what they can in their severely unwritten roles but too often they’re relegated to inhabit angsty teen archetypes, even from the opening scene when Light is seen sulking on a set of bleachers while Mia stands triumphantly blasé atop a pyramid of cheerleaders. In worse shape is Lakeith Stanfield, who has been brilliant in smaller roles so far this year (Get Out, War Machine) but is utterly lost in this twitchy, self-conscious role that is a flat-out terrible fit for his low-key charisma. By far the most memorable performer is Dafoe as the voice of the CGI creation Ryuk, who is basically reprising the cackling menace from his Green Goblin role in Spider-Man but nonetheless effective in doing so. 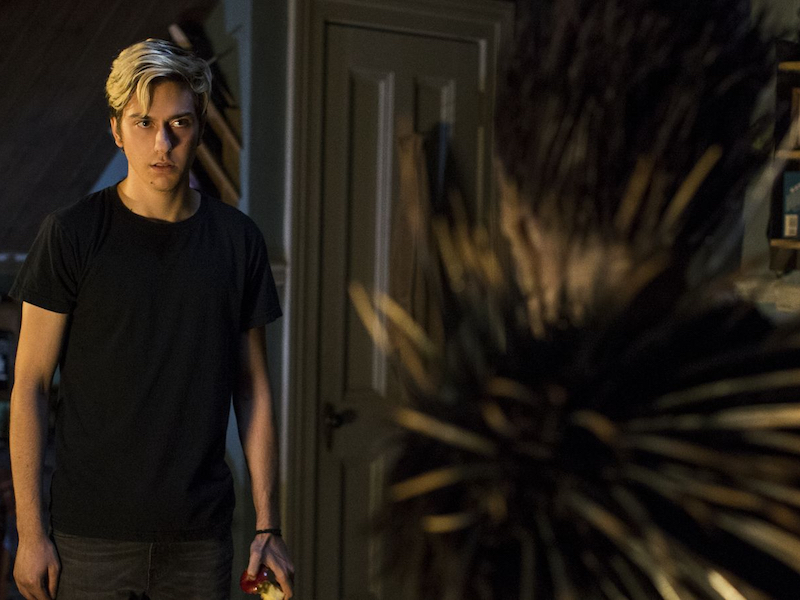 Despite the growing issues that I had with plot or performances, Death Note is not often a boring endeavor thanks mainly to the typically stylized direction from Adam Wingard that utilizes campy genre elements and cheeky 80s-inspired soundtrack choices to liven things up a bit. Sadly, the script credited to three writers (I’ll spare mentioning their names) is ultimately too leaden to lift as it favors an inelegant unpacking of its most basic narrative mechanics over character development or moral complexity. Perhaps the team here was too constricted by the feature film medium and a mini-series or full TV series would have been a better fit but as a standalone movie, I doubt it will reach any of the unconverted.